Leander Kahney's Tim Cook: The Genius Who Took Apple to the Next Level, is the first biography of Apple's CEO and follows Kahney's similar book about CDO Jony Ive. It's a comprehensive account of Cook's career and explores how a person so different to Steve Jobs successfully built on the Apple founder's legacy. Both this and the previous Jony Ive: The Genius Behind Apple's Greatest Products do have the problem that their subjects did not talk to Kahney directly. Apple did not make Cook available for the current book, but the company gave its blessing by offering time and access to high-ranking executives. Those interviews were conducted at Apple Park. The C-suite interviews include an extraordinarily rare one with Deirdre O'Brien, Apple's new head of retail. Only, neither she nor any other Apple people who spoke directly to Kahney offer very much beyond background color on Cook's ascendancy to CEO. Instead, the majority of quotes and interviews in the book are from previously published accounts. Kahney acknowledges this and he's made a comprehensive bio using them, but it still means that points tend to be familiar. Since Cook says little publicly, compared to Steve Jobs for instance, there's a good chance that you already know most of the quotes from him. One exception is in a long section about Apple's response to the FBI demanding a backdoor into iOS in response to the 2015 San Bernardino terrorist attack. We've seen how Apple reacted but Kahney brings us the inside story of what it was like and how the company worked to counter criticisms in a hugely contentious time. However, while the full description of that San Bernardino incident is absorbing, we're introduced to it first with an aside that presumes we already know all about it. You can expect that someone who buys a Tim Cook biography is likely to, but such a person is also likely to know that iOS 7 controversially dropped skeuomorphism -- and we're introduced to that three separate times. Consequently, this feels less the compelling book that Kahney's Jony Ive bio was, and more a like series of magazine articles to be dipped into. What it does best of all is manage to be praising of Cook without feeling sycophantic. There is a sense of a significant person being examined and Kahney is vastly more informed about Apple and technology than, say, Steve Jobs's biographer Walter Isaacsson was. Consequently, unless Cook himself writes a book, it's unlikely that there will be another biography that is as comprehensive as this one. It's only a shame that whatever it was that made Kahney's bio of Jony Ive feel like an absorbing novel is missing here. Tim Cook: The Genius Who Took Apple to the Next Level is published by Portfolio Penguin and can be preordered on Amazon for $27 in hardback. 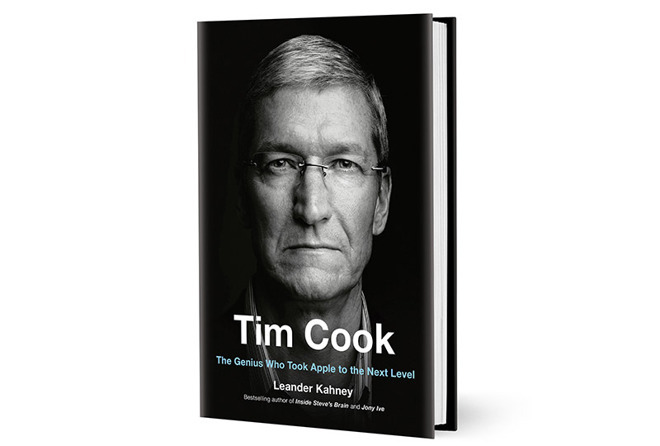 Portfolio is generously offering 48 copies of Leander Kahney's Tim Cook: The Genius Who Took Apple to the Next Level to AppleInsider readers, who can sign up for the giveaway below. Entries will be accepted through April 19 and winners will be chosen at random and announced on April 20. I like him. And will definitely get the audiobook next....on iTunes of course! Just don't like the 'good enough' lack of quality from Amazon, Google, etc. Basically all the rest out there. "Sometimes, 'easy' is better than 'free!' Stevo Jobs, circa 2019 (I wish). Odyssey II: from Compaq to Apple. That empire is now shaky at this next level. I wonder how Cook will deal with market saturation while lowering quality of Apple products as it stands (yes they are lower quality than 10 years ago). Steve believed in giving regular people a chance to shine (examples Jony and Tim). Tim runs after successful people like a little girl at a Bieber concert. Ummmmm.... what tf are you talking about?? The only industrial designer I’ve ever heard in the same breath as Jony Ive, is the incomparable Dieter Rams. He’s won literally dozens of awards & is likely in the top 5 list of best industrial designers in the history of mankind. His designs have permanent spots in museums across the world. He was knighted, based solely on the enormity of impact his designs have had on the world, for crissake!!! Lots of designers at other tech companies listed on the senior leadership pages? Get real. Jony was/is an absolute legend in the field. He was well into his craft when he & Steve met... recognizing genius & hiring and giving great power/authority because of it is a VERY far cry from: “finding a regular person, and giving them a chance to shine”. You got the wrong end of the stick. Bloggerblog was actually stating that Jony and Tim were "normal people," and Steve give them a chance to shine. Ive was at Apple pre-Steve, and produced things like the hideous All-In-One G3 and the Twentieth Anniversary Mac. Steve signed off on the iMac as one of the first computers on his return in '97, whose design was radically different from previous Macs and most definitely Ive-led. Recognising genius in a "regular person" is exactly what Jobs did with pretty much every hire before Apple grew to be massive. Cook imports people who he thinks suit the position, but IMO he can't spot genius. His choices (Browett, Ahrendts) haven't exactly been great. "Ive joined a London startup design agency called Tangerine, located in Hoxton Square where he designed a diverse array of products, such as microwave ovens, toilets, drills and toothbrushes." - Wikipedia. Jobs gave him the project that turned his career around, the iMac.